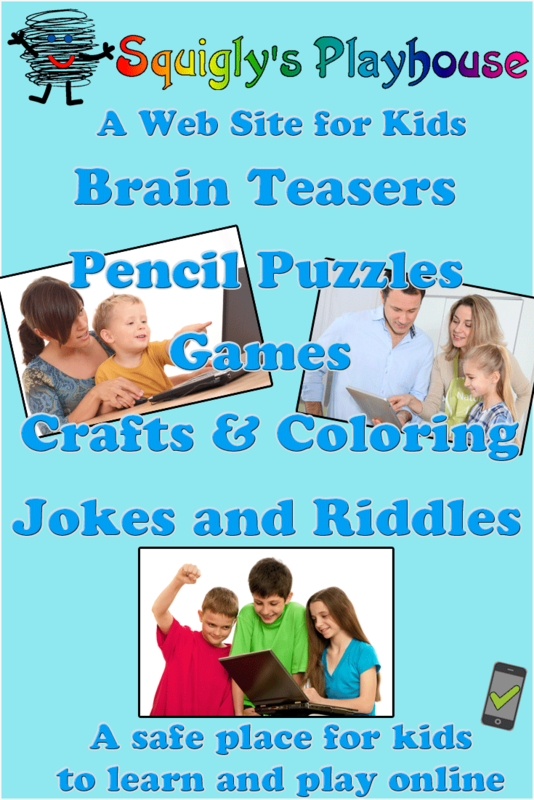 Cool Games, Brain Teasers, Jokes, Coloring Pages, Crafts and more! You'll find lots of fun things to do here. We have tons of free online games, brain teasers, jokes & riddles, and puzzles! Try our free printable coloring pages and pencil puzzles, our craft ideas, and more. Squigly's Playhouse is a fun and safe place for kids to play and learn. Use our activities at home or in the classroom. Q: Why did the skeleton stand in the corner during his prom? Q: What do you call a frog that parks in a tow away zone? A: A TOAD away zone. We are so glad you are here. Our activities are fun and entertaining and can be used free of charge in the classroom and at home. We have cool kids games including action, racing, sports, puzzle, dress up, 2 player and even cooking and educational games. These games do not require watching an ad before game play. We have awesome arts and craft ideas and funny jokes and riddles and knock knock jokes. Our printable brain games, puzzles and coloring pages are all free too! We love to celebrate the seasons and holidays so you will find lots of fun activities for each.